Roj Gosh Mah Dae, 1381 Yz. In the meanwhile, the deposed king passed the one month cleansing his soul, offering payers to the Almighty who had raised him so high and now broken him. Despite all the luxuries and servants available to him, Khosrau Parvez remained closeted with his wife Shirin, only eating the food that was lovingly cooked by her. As this sorry state of events continued, there were a few members of the court of Khosrau Parvez who still remembered their real King and his large hearted rule. One of these was the great musician Barbad, the Jahromi. This amazingly gifted musician maybe regarded as the Tansen of Khosrau Parvez’s court. His beginnings were, however, very humble. 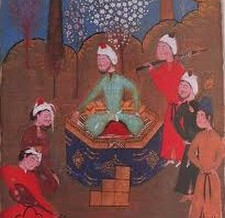 In the early years of the King’s reign, the court musician was a person called Sargash who was an accomplished artist. However, Barbad had a natural talent and virtuosity which was unrivalled. When Sargash heard Barbad playing, he realized that if ever the King heard him, his own position in the court would be in danger. So he bribed the guards at the palace door to ensure that Barbad was never allowed entry to the King’s court. In this way, despite many attempts, Barbad could not have access to the King’s ear. On hearing the King’s words, Barbad descended from the cypress tree and revealed himself, bowing down before the King and asking for mercy as he explained the reason for his having entered the palace complex in this manner. 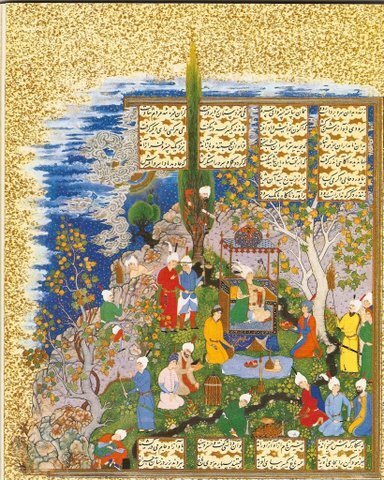 The King scolded Sargash for his dishonesty and appointed Barbad as the King of the court’s musicians. Under King Khosrau Parvez’s patronage, Barbad displayed his true genius. He totally revolutionized Iranian music by arranging its order and melody based on the Zoroastrian calendar. Thus there were seven main ‘Royal Modes’ (Khosrovani, or Thaat in Hindustani classical music) named after the 7 Amesha Spentas (the first seven days of the Zoroastrian calendar). From these seven, 30 derivative melodies (called Lahn, equivalent to Indian Ragas) were derived, corresponding to the 30 Roj of the Zoroastrian calendar. Further 360 lyrical melodies (called Dastan) were derived from the Lahn. Much of modern Persian music is still derived from this ancient musical system. In this manner, the 38 years of glorious rule of King Khosrau Parvez were marked with great celebrations and concerts in which Barbad was the center of attention. Now, as the King lay under house arrest and the weakling Shirooy was seated on the throne of Iran, a great bitterness and sorrow arose in Barbad’s heart. He was filled with melancholy that the royal Patron who had supported him for so many years was now reduced to this status. 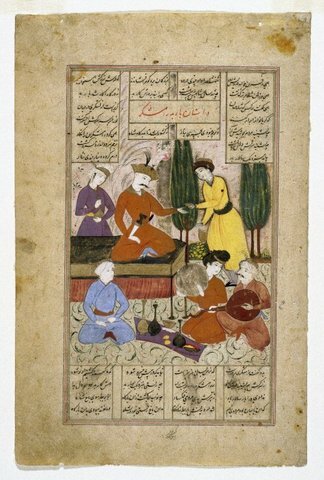 Barbad’s undying love and affection for Khosrau Parvez was so intense that the musician could no longer bear to enter the court of the weakling King. He wandered away from the court, and after a few day’s travels arrived at the palace of Mahrespand, where Khosrau Parvez was imprisoned with his wife Shirin. Standing outside the palace and taking his beloved Tanbur in his hand, Barbad began singing one of the most melancholic dirges he had composed, in the Pahlavi language. ‘O King of Kings! Where is your majestic court and your dignity! Where your lustrous Khoreh and your amazing fate! Where is your Royal Crown and the Kayanian cummerbund? Where has your strong muscular body and amazing strength disappeared, with which you ruled over the entire empire with such an iron fist! Why is your luminous court and the glittering harem today filled with darkness? Where are your ungrateful musicians, who used to sing and play with such outstanding beauty in your days of glory? Where is your magnificent robe, studded with diamonds and rubies, where is that stately horse Shabdiz without whom you would never ride out to battle? Where is it all gone, what has happened to our country? Where are the lakhs of battle hardened soldiers and the thousands of elephants and horses? Is there no one to speak in favour of my King? O what secrets does Time hold in her bosom – propelling one from the dirt to the highest levels and then reducing them to dirt again! Saying so, this most patriotic and gifted musicians of all times took out a small dagger from his coat, and with the amazing courage of his conviction derived from religious and devotional fervor, Barbad chopped off the four fingers of his right hand – with which he had made such magic with his lyre. Clutching the chopped off fingers in the fist of his other hand, he went back to his residence and lighted a huge bonfire in which he threw his most precious musical instruments – the lyre and tambour, the sitar and saz. From that day onwards till the day he died shortly thereafter, Barbad never uttered another word and passed his last days in silent lament of his beloved King and his ill-starred destiny. Readers of Frashogard, let your hearts be filled with pity and sadness as the magnificence of King Khosrau Parvez now comes to an end in a most treacherous manner.